While we may be drowning in the final harvests of cucumbers and green beans, there will come a time, a time far too soon, when we yearn for these bountiful days of summer. The growing season in New England is short – typically lasting from the beginning of April through the end of October, a total of just seven months. Anything that can prolong this short season, even if just for a few weeks is a welcome reprieve from the threat of cold winter days.A season extender can be as simple as a tarp draped over the garden or as complex as a greenhouse, but all act to shelter your crops to get an earlier start in the spring, or keep growing into the late fall. Greenhouses may be the most well known type of season extenders, though for most backyard farmers they are too large, too time-intensive, and too expensive. 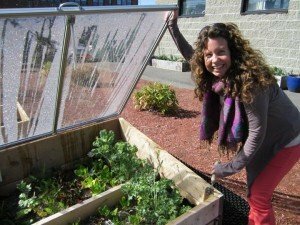 Cold frames, however, act as miniature greenhouses and sit on top of your raised bed frame or directly over an in-ground garden, and are an excellent solution! The plastic or glass-lidded frame traps the sun’s rays, warming the air inside the frame to up to 30 degrees more than the outside temperature. The lid is attached with a moveable arm, which is filled with wax. As the sun shines upon the frame, the wax warms and expands, pushing the arm and opening the lid to vent, which prevents the air from becoming too hot and scorching the plants. Growing in a cold frame is different than growing food at any other time of the year. In the fall, the weather is usually cold and there are far fewer hours of sunlight. The plants that do best in these conditions are cool weather crops, some of which might survive a hard frost. Plants that are nearly mature and can be harvested as needed in the late fall would include lettuces, greens, broccoli, kale, collards, cabbage, hardy herbs, carrots, chard, radishes, and spinach. When Should You Install Your Cold Frame? Through the fall months, you may still be harvesting fruiting crops such as peppers, tomatoes, eggplants, and perhaps cucumbers and squash. When deciding when in the fall to install your cold frame, consider sacrificing some of your existing summer crops, as the lower height of the cold frame will prohibit these tall plants from thriving. Typically, we let the frost-sensitive, warm-weather crops continue producing all the way until the first frost date, and then install the cold frame right after this first frost date. 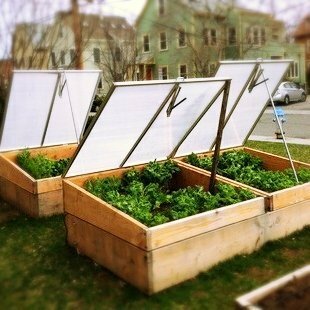 You could also consider covering just half your bed with a cold frame, which would allow you to grow summer crops, while still allowing fall crops to germinate. You’ll want to plant ‘quick-cool’ crops like radishes if you don’t have a cold frame, as many fall crops will need to have been planted weeks ago for successful harvesting. With a cold frame, you could plant some crops like cabbage or kohlrabi that wouldn’t reach full size without an extended season.